Tiny Celtic cross earrings are sterling silver studs with embossed knot-work. 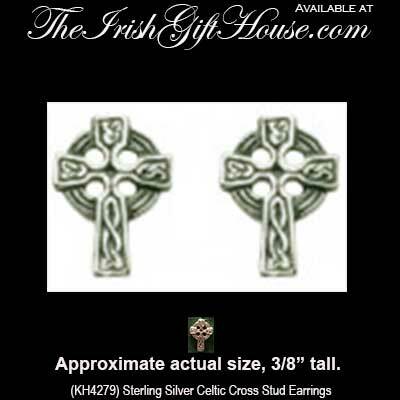 These Celtic cross earrings are tiny, but due to the normal length of the studs, these Irish earrings are not suitable for babies or small children. These sterling silver Celtic cross earrings are stud style and feature engraved Trinity knots. The tiny Irish earrings measure 1/4" wide x 3/8" tall and are gift boxed with Celtic cross and Celtic knot history cards, complements of The Irish Gift House. The Celtic cross earrings are made in Scotland by Kit Heath Jewelry. These Celtic cross stud earrings feature push on butterfly backs. Celtic cross drop earrings are crafted in sterling silver and feature marcasite stone settings. Sterling silver Celtic cross earrings are small studs that feature embossed detailing. These sterling silver Celtic cross earrings feature engraved Trinity knots.